Lots of things work in practice for which the laboratory has never found proof. Please click on any question to be directed to the answer below. Is massage therapy safe for people living with cancer? As a massage therapist, what do I need to work with people with cancer? How do I decide which oncology massage training program is right for me? What questions should I ask about an oncology massage training program before registering? Are there certification programs in oncology massage therapy? Will this or another course certify me in oncology massage? If I don't put "certified in oncology massage therapy" on my business card or brochure, what should I put? I am interested in manual lymph drainage training (possibly to treat clients with lymphedema). Which training should I take? Which ones will certify me? For information on courses we are currently offering, visit our Training Schedule page. Yes, when practiced by a skilled therapist with background or training in massage and cancer. If this was not covered in their basic training in detail, they should have advanced training in the work. Massage should be modified to work around side-effects or complications of radiation, chemotherapy, surgery, and medications. Blood counts should be considered in massage design, as well. Even after years of survivorship, there are a few simple but critical adjustments in massage therapy, for example, if lymph nodes were removed or treated with radiation, or if bone metastases are present. Therapists with experience and training are aware of these and other adaptations for cancer treatment. Be sure to see a massage therapist who asks about treatments during the interview and who explains any needed massage modifications. A skilled therapist will combine a thorough intake process with sound clinical judgement and clear communication about what to expect in the session. They will adapt the massage to your needs and requests, fashioning a hands-on session that relaxes, energizes and reduces pain and discomfort. No, it cannot. Massage of a solid tumor site should be avoided, but there is more to a person than a tumor site. An old myth warned that massage could, by raising general circulation, promote metastasis, since tumor cells travel through blood and lymph channels. We now recognize that movement and exercise raise circulation much more than a brief massage can, and that routine increases in circulation occur many times daily in response to metabolic demands of our tissues. In fact, physical activity usually is encouraged in people with cancer; there is no reason to discourage massage or some form of skilled touch. Massage is practiced widely at the Dana-Farber Cancer Institute, Memorial Sloan-Kettering, and growing numbers of hospitals around the country. Metastasis is not a concern; instead, patients and researchers report countless benefits. (click to read Debra Curties' excellent article about massage and cancer spread). Massage has many benefits for people living with cancer. A few are listed below. We know some of these from clinical observations, some from controlled research, and some from what clients tell us directly. Massage may be a viable, low-cost approach to minimizing this difficult side-effect of medication. Continuing education training is strongly recommended, preferably with a hands-on component. During their basic massage training, many massage therapists were discouraged from working with people with cancer, and training is needed to move forward with the work. 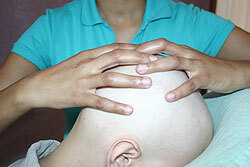 To work with people with cancer, massage therapists need to know how to work with complex medical conditions: detailed interviewing, recognizing possible massage contraindications and other red flags, researching cancer treatment's effects, applying massage adjustments in massage pressure, joint movement, areas of focus, position, massage lubricant, and when and how to consult the client's physician for needed information. Therapists need to "know what they don't know" and how to fill in gaps in information. Some therapists may be able to teach themselves how to work safely and effectively with people with cancer, using texts, massage literature, research skills, or on-line courses. Some have medical or nursing training that enables them to sort through clinical presentations and adapt their massage work accordingly. But most therapists need training that provides skill building in interviewing and clinical thinking, hands-on practice, and supervised clinical work. They need a framework to work within, opportunities to ask "what-if?" questions, to hear clinical scenarios, to use appropriate intake and other forms, and to have materials for further learning at home. Therapists need to be able to adapt to clients with lymphedema, lymphedema risk, bone metastasis, vital organ involvement, risk of deep vein thrombosis, and suppressed blood cell populations. They need to craft an intake and a session for someone with a cancer history, not just with active cancer. Moreover, therapists need to customize their work to individual client presentations, not offer a one-size-fits-all massage for everyone with cancer. In fact, some people in cancer treatment are active and robust; others are medically frail. A well-prepared therapist recognizes the difference and can adapt to a full range of clinical possibilities. Good training supplies the tools to meet this range in clients and the chance to practice using them, so that one client doesn't receive massage that is too gentle for them, and another too strong. Increasingly, facilities that offer oncology massage are requiring therapists to have advanced instruction in this area. They may require a particular training, or a certain number of hours or clinical experience. An advantage of oncology massage training is the chance to spend time and network with other like-minded professionals. Therapists who choose oncology massage make up a particularly committed, passionate and thoughtful group of practitioners, and it's a rare chance to spend training days in such company. You might find that others in the training have started programs, worked in specialized settings, found interesting work opportunities, or have useful contacts for furthering your own work. This is a rapidly growing field in massage therapy and new courses are being added all the time. Your best resource is the Society for Oncology Massage, which sets clear standards of practice and recognizes instructors that meet them. Investigate available courses, look at different websites, ask to speak to previous participants. Question the providers. We made a list of some of the questions to ask providers in order to see if a program is right for you. To save time, we've put our own answers in italics after each question. 1. Is reading required ahead of time? 2. Is a hands on component included in the course? 3. Is there a clinic with a chance to practice with people with cancer and cancer histories? Yes, on the last day. 4. Do you provide a medical history form for use with clients with cancer? A form for physician's permission? We provide both and you are free to use or adapt them. 5. Will you provide us with good questions to ask clients in order to identify massage contraindications, and teach us how to use the client's answers to those questions? Throughout the course we keep a running list of interview questions related to each topic we discuss, and we discuss follow-up questions for each, and specifically how to adjust the massage for the range of possible client answers. A good, sturdy list of interview questions is also provided in the course manual. 6. Is there a lot of material to memorize in your course? We prefer to teach principles that are easy to remember and can be applied to any cancer population in any setting, rather than bunches of facts to memorize. As an example, there are four questions to ask about any cancer drug, along with guidelines for adjusting the massage to each answer. This is much easier to remember and apply than a long list of cancer drugs, their effects, and massage contraindications. 7. Will I be able to work in any cancer setting after this course? Course participants have gone on to work in hospital settings, home care, spa or retreat settings, outpatient clinics, and hospice facilities. Repeatedly we are told how well prepared they felt in those various settings. 8. Do you teach us about research about massage and cancer, and how to use the strongest research to promote oncology massage? I feel strongly that if we mention massage research to promote our work, that we are better off citing the best studies. For this reason, we review several of the key studies in oncology massage, look at their strengths and weaknesses, and discuss how to use them in our promotional materials. 9. Will you teach us to educate others who are still fearful of massage spreading cancer? This piece is vital in order to be fully prepared to advance our work. Many people-clients, MT's, health care providers-have heard this old myth. In our course we discuss simple, concrete ways to allay their fears. 10. Will we learn specific adaptations for tumor sites, bone metastasis, lymph node removal, chemotherapy effects, bone marrow suppression, deep vein thrombosis risk, vital organ involvement? Yes, all of the above. And good intake questions to determine whether those adaptations are necessary. 11. Will we learn about massage adaptations for cancer survivors, not just people with active cancer? There are some contraindications that linger for years after cancer treatment, and others that disappear. We study the difference. 12. Do you provide resources for questions that might come up in practice, after the course? There is a hefty manual that participants use throughout the course and take home with them as an ongoing resource. This website is designed to share news and support therapists in their work, and resources are added to it regularly. Supervision and consulting are available as well as moral support from our office. 13. Are there chances to appreciate the emotional or spiritual challenges of oncology massage work, and to feel it "from the heart" as well as the head? Yes. One way is through sharing words and music by people with cancer and cancer histories. Another is through simple, lighthearted hands-on experiences that make room for deeper connections with our clients and ourselves. 14. How long is your program? Our 4-day intensive is 32 ce hours. Our 1-day advanced seminar is usually 8 ce hours. 15. Are you an NCBTMB Approved Provider? Yes, we have been approved since 1999. Are there certification programs in oncology massage? Will this or another course certify me in oncology massage? We are (1) recognized by the Society for Oncology Massage, and (2)a NCBTMB approved provider. Also, (3) we issue a "certificate of completion" for 32.0 CE hours at the end of our 4-Day Intensive. Finally, (4) we notice our course is often mentioned to hospital job applicants as a requirement to be on staff in oncology settings. Our 4-Day Intensive qualifies you to apply for membership in the Society for Oncology Massage, and listing in their Oncology MT locator service. That's the short answer. The longer answer? The term "certification" is a tricky one in massage CE, because it implies that there is a nationally or state-wide recognized credential. In oncology massage, there is no nationally recognized, credential with government oversight. The only nationally recognized certification or credential in massage therapy is more general, not specific to oncology massage: it is certification by the NCBTMB (National Certification Board for Therapeutic Massage and Bodywork). That said, other providers offer wonderful, reputable oncology massage programs that use the term "certification." They tend to be longer, time-intensive courses of study. We choose not to use the term "certification" for our courses because there is no clear direction in massage CE about how the term should be used, and there is no government oversight for the use of the term. We issue a Certificate of Completion, as most CE providers do. In answer to the question, "will your course prepare me to work with people with cancer?" Our students tell us overwhelmingly that it does, and they turn around and use their training the next day in their private practice, hospital, clinic, franchise, or spa. They tell us they can not only manage the cases we covered in class, but apply the principles and skills they learned to unfamiliar client cases. We love knowing that the information and skills are immediately usable. There is no licensure in oncology massage therapy. Licensing is performed by states, and there is no recognized license in oncology massage therapy. For a listing of oncology massage trainings, see our Resources link. Contact each program or visit their website to learn about the parameters of each program. Ask the questions, above, to determine whether the course offered is complete and if it's a good fit for you. We do not take a position on which MLD approach to study, as the field of lymph drainage therapy is wide open and there are several different approaches (Vodder, Foldi, Casley-Smith, Klose, Chikly, Zuther, and Upledger, to name a few). Instead, we recommend that you research the different methods, asking the following questions about the trainings you are interested in: What are your training requirements? Prerequisites? Who will I be qualified to work with, once I complete your training? At what point will I be able to work with pathologies, such as lymphedema? What is your approach to people with active cancer, in treatment, and with cancer histories? What are the prospects for insurance reimbursement for the work if I study this method? What types of referral networks do you maintain? When may I be listed on the network? How is your approach different from the other approaches to manual lymph drainage? What do your training materials consist of? How much hands-on time is included? Will I learn compression bandaging for the treatment of lymphedema? Is there a supervised clinic so I can practice the work with lymphedema patients? Is there a practical or written exam? What type of certificate would I be issued? Is there an ongoing supervision/consulting service available? We recommend that you visit the National Lymphedema Network website if you are interested in this work. 1. Lawvere, S, “The effect of massage therapy in ovarian cancer patients,” in Rich, GJ, ed. Massage Therapy: The Evidence for Practice. Edinburgh: Mosby, 57-83, 2002. Also in Ahles, TA et al., “Massage Therapy for Patients Undergoing Autologous Bone Marrow Transplantation,” Journal of Pain and Symptom Management 18:157-63, 1999. Also Field, T. et al., “Massage Reduces Anxiety in Child and Adolescent Psychiatric Patients,” Journal of the American Academy of Child and Adolescent Psychiatry 31(1):125-131. 2. Ahles et al. (above), Wilkie, DJ et al., “Effects of Massage on Pain Intensity, Analgesics and Quality of Life in Patients with Cancer Pain: A Pilot Study of a Randomized Clinical Trial Conducted within Hospice Care Delivery,” Hospice Journal 15:31-53, 2000. Grealish, L et al., “Foot massage: a Nursing Intervention to Modify the Distressing Symptoms of Pain and Nausea in Patients Hospitalized with Cancer,” Cancer Nursing 23:237-43, 2000. 3. Weiger, WA et al., “Advising Patients who Seek Complementary and Alternative Medical Therapies for Cancer,” Annals of Internal Medicine 137:889-903, 2002. 4. Ahles et al, above. 5. Dibble, SL et al., “Acupressure for Nausea: Results of a Pilot Study,” Oncology Nursing Forum 27(1):41-47, 2000. 6. Lively, BT et al., “Massage Therapy for Chemotherapy-Induced Emesis,” in Rich, GJ, ed. Massage Therapy: The Evidence for Practice. Edinburgh: Mosby, 85-104, 2002. 7. Smith, MC et al., “Outcomes of Therapeutic Massage for Hospitalized Cancer Patients,” Journal of Nursing Scholarship 34(3): 257-262, 2002. Tracy Walton & Associates is approved by the National Certification Board for Therapeutic Massage and Bodywork (NCBTMB) as an approved provider, #283404-00. Tracy Walton & Associates is approved by the Florida Board of Massage Therapy, provider #50-13512. Selected training is recognized by the Society for Oncology Massage.